I wanted to share this adorable blush dress for today. Which I want to add is non-maternity! The fit of this dress just happens to be perfect if you have a bump. It cinches at the waist making it perfect to fit above the belly, and the high/low is perfect for a growing belly. I would recommend going up a size because this dress does fit a bit small. (I am wearing a size 4). The best part of this dress is it under $100! YAYY! Side note: online the color of the dress says it’s Ivory, and I may be slightly colored blind, but I totally think this is blush and not Ivory. But what do I know? Haha! I love the blush color and the florals of this dress. It makes it perfect for Spring, or even an Easter outfit! 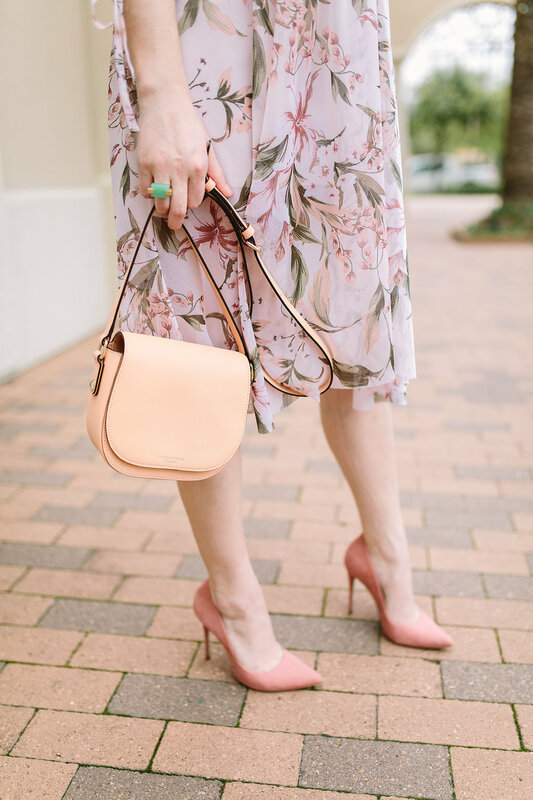 I wanted to keep the whole look girly and soft, so I went with my blush heels and my mini saddle crossbody that compliments the dress so well! Changing topics for a bit. I am sending out an SOS. I’ve talked about here and there how hard it has been to get the boys to sleep in their room. They used to do so well and used to be such great sleepers. Well, fast forward to sometime last year, Jadyn and Colin got sick. We brought the boys down to sleep with us so we could keep an eye on them. From then on, all they want to do is sleep in our room. We finally broke one of the habits, and they finally fall asleep IN their room. The problem is that now, we just can’t get them to stay in their room. Every night, like clockwork around 2 a.m. they come into our rooms and sleep on the floor. We used to have carpets, but now it’s wood floor, and Jadyn has not been sleeping well. Poor little guy sleeps like on his pillow to stay comfortable, and we have tried everything. And it’s gotten to a point where Jordan and I are always being woken up because they keep coming down. Colin on the other hand just climbs in our bed because he see’s that he has room. And this guy is not a sound sleeper. So from one drained mama, to another, I need help, suggestions, and ideas on how to keep my kids IN THIER room. Because when baby number 3 comes, I don’t know what we are going to do! Love you all so much and so grateful to have a group of women that I can always count on! 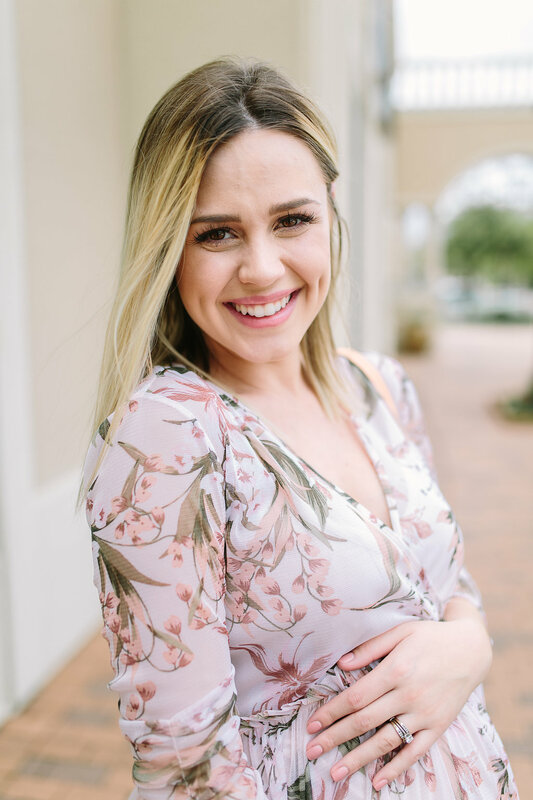 Thank you for stopping by and checking out this blush dress be sure to check out more fashion posts before you go, have a great day! You are looking astonishing dear mommy! This dress was made for you and your maternity style! Do you try putting them back in their room when they come in? I’m sure you have! But if you keep taking them back to their room, maybe it’ll reinforce that? Also, I remember going into my parent’s room because I was scared, have they voiced any fears? I’ve heard of parents having to put a reverse lock on the door. I personally had a hard time with this concept because I felt like a monster but after experiencing it for myself I had to do something similar for a short while and now my son gets it (for now anyway, he’s 2YO). Might be worth looking into now before baby brother arrives. Ps I love that dress!! They have alarm clocks for kids that will turn a certain color when it’s time to wake up. Maybe working with the boys to set the alarm for just a little earlier than their wakeup so they still have a couple minutes to crawl into bed with y’all in the morning but everyone’s sleeping better at night? Hey Elly, I just came across this post on Pinterest. My 5yo son does the same thing, goes to sleep fine in his room and then comes into our room around 2 to spend the rest of the night in our room. It’s not uncommon from what I’ve heard. Some of it is habit, but little kiss also need reassurance still at this age, and it can be scary to go back to bed in the dark! A solution that has worked great for us is a crib mattress. My son barely fits on it now, but it’s better than him trying to crowd into our bed, and he still feels safe being in our room with us. His sister is 2.5 and based on her personality, I doubt she will do the same thing … but I would just add another crib mattress. 🙂 Would something like that work for you? FWIW I would absolutely not lock them out of your room. They are still little, I’m guessing, and they have a big change coming up with a new baby sibling. It could be that when the new baby arrives, you may have to shuffle rooms around some more for a while, but it’s all a phase. They won’t be doing this forever. 🙂 Good luck! Hey Amy, I wanted to avoid getting a mattress to encourage them coming down. I feel like each week that passes by, we get better and better. Now they don’t come in around 12 or 2 a.m. But it seems like they come down early morning around 5ish. I won’t lock them out, I really don’t feel safe with that, and I keep reminding myself it’s just a season and this too shall pass. Wehre or how van I buy this dress? Hey Nee! I am so sorry, this dress is several years old, so I linked a similar one. I am so sorry!